A library card is one of the most powerful tools you can give your child. This year The Incredibles are joining Tacoma Public Library, the American Library Association (ALA) and other libraries nationwide to encourage the public to obtain a free library card as Honorary Chairs of Library Card Sign-up Month this September. 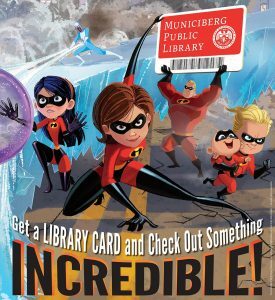 The Incredibles will use their superpowers to remind families, students and people of all ages that signing up for a library card is a great step toward a truly super lifestyle. Providing free access to STEAM (science, technology, engineering, arts and math) programs, educational apps, in-person and virtual homework help and technology workshops, a Tacoma Public Library card is one of the most cost-effective back-to-school supplies available. Library Card Sign-up Month is a time to highlight the supportive role libraries and librarians play in transforming lives and communities through education. Studies show that children who are read to in the home and who use the library perform better in school and are more likely to continue to utilize libraries as a source of lifelong learning. We are fortunate in the powerful partnership between Tacoma Public Schools and Tacoma Public Library where students can use their student ID as a Tacoma Public Library card. If you attend a different school, you can still sign up for a regular Tacoma Library card. Visit your local Tacoma Public Library today!